Good morning everyone. It’s a bright, sunny, beautiful day here in Las Vegas. Thank you all for joining the call today. I just want to go over a few fight facts real quickly. We’ll be bringing you a double header of super middleweight title fights. Our event is promoted by Mayweather Promotions, in association with Interbox and Matchroom Boxing. The main event will feature Badou Jack versus Lucian Bute for the WBC Super Middleweight World Championship. Also on the card will be another very exciting televised bout. It will be featuring the IBF Super Middleweight Champion, James DeGale. 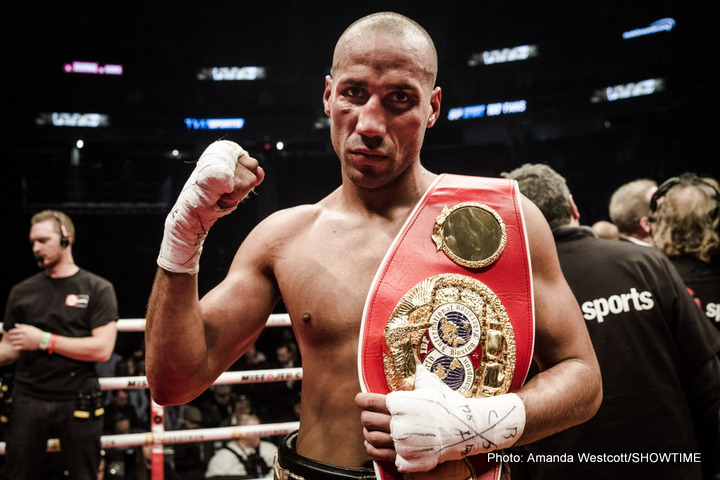 DeGale will be fighting his mandatory challenger, Rogelio Medina. And the winners, all four fighters, have agreed to meet in a Super Middleweight Unification fight later this year. Well first up I’d like to introduce Lucian Bute. He comes to us with a 32 and 3 record with 25 big knockouts. He’s fighting out of Montreal, Canada by way of Romania. He’s a former IBF with nine title defenses between 2007 and 2012. His most recent performance against James DeGale was a very exciting bout and the fans were very impressed and earned him the right for this title shot. So without further ado, I’d like to introduce Lucian Bute. Hi everybody. I think camp is going very well. Still very, very good. I’m very comfortable and very confident for this fight. All my hard work is done – just have a few days here in Montreal. Next week we coming in to Washington, DC. Everything is going well. Okay. Next up I’d like to introduce the WBC Super Middleweight Champion of the World, none other than Badou Jack who is coming with us with a 20 and 1 record, with 12 big knockouts. He’s fighting out of Las Vegas by way of Stockholm, Sweden. He’s Mayweather Promotion’s top fighter. He won the WBC Super Middleweight Title with a 12 round majority decision over Anthony Dirrell last April. He retained it when he caged George Groves last September on the Mayweather-Berto undercard, which was a very exciting fight. So Badou, would you like to say a few opening words? Yes. How’s everybody doing? I’m very excited for this fight. We’ve been training for more than 12 weeks. We’re definitely ready. All the hard work IS done and I can’t wait to fight. I’m very, very excited. Lucian Bute is a very tough opponent, so I have to bring my A game. I feel we’re going to put up a very good fight, a fan friendly fight for the fans. Thank you. Badou, can you talk about your approach to this fight? How do you think you’re going to be able to win and retain the title? I always believe in myself. That’s the main thing. I’m not trying to be fighting like no other fighter. I’m trying to do what I can do just to win. So I’m excited. I know I have probably the toughest test of my career. I’m excited. I just want to fight. That’s what I want and to do my thing. I’m very, very comfortable that I’m going to beat him. What do you think are your advantages in this fight? I think I’m a little bit younger, three years younger I think. I’m a little fresher I think. But he’s got a lot of experience. He got way more experience than both Dirrell and Groves. So you never know in boxing. It’s a hard business and he’s the guy up. We’ve been training real hard, so we are ready. Lucian, tell us why you think you’re going to be able to win this fight and capture this title. Like I said, my confidence before the fight with DeGale was not 100%. Now it’s back 100%. I feel good. I feel strong. The training time is going very well. I feel very comfortable. I think it’s a big opportunity for me to become world champion for the second time. I will do that in Washington, D.C.. I’m very confident about that. What happened before the DeGale fight? Was it the fact that you had one fight before that? I was not comfortable maintaining my fitness. I had a long period to break. I’m healthy in this moment. Everything is going well. I had one fight before DeGale, a tune up fight. Against DeGale I think I looked good and everybody saw I’m very competitive in the high-level fights. What did you learn from the Carl Froch fight that maybe you’re taking into this fight about how to manage the pressures of fighting away from home? My last fight for the title fight was in 2012, and the pressure wasn’t on me. If I don’t have the title, the pressure wasn’t on my shoulders. But now it’s different thing. The champion is Badou Jack in the United States and the fight is in Washington, D.C.. I’m very comfortable with that. I have no pressure. I’m coming in to Washington, D.C. , looking forward to become world champion on April 30. Now this will be your third fight working with new trainers. In what way have they changed you as a fighter? How has your style changed in your opinion now that you’ve been working with them? We work very hard. Last year we started. We started to have chemistry where we understand by just looking at each other. We work very hard. I’m more aggressive in moving my head. Letting my hand go. I feel very comfortable with this, like Lucian Bute at the beginning. What did Floyd Mayweather say or do for you to help you bounce back the way that you have from your one loss? He just said that anybody can get caught with a good punch. I know you’re better than that guy you lost to. Just keep your head up good and bounce back. It was nothing that he really did to help me to bounce back. In boxing anything can happen and fast. I proved that that was just a lucky punch or an accident or whatever. I proved that in my last couple of fights. So everything is good. It was actually a blessing because people were overlooking me because of that loss. What does it feel like for you then having been in the background or having people overlook you to now be in a headlining role on SHOWTIME in a fight coming up? Like I said, it’s a blessing. I’m very, very comfortable, very happy and I’m glad that my opponent is very confident too. That’s what we want him to be. Just like the last two opponents, they were very confident. So I’m looking forward for to a great fight. The same question for both fighters is how do you like this tournament situation you’re in? It’s something to look forward to, but you have to respect your opponent and you have to respect what’s in front of you. That Lucian Bute is a very tough time. So I’m thinking about him right now, that’s all. I’m focused on him. But, you know, after that we can talk about the next fight. Yes. I’m excited. I feel great. It’s a big opportunity. But like Badou said, I’m very focused, very content in this fight. If I take this belt, after that we’re looking forward to have an opportunity to unify the titles. I would love to have a chance to unify the fight. But I’m very, very focused on April 30. How did you prepare for a strong punch or a strong left-handed punch like Lucian Bute? Well I’ve fought southpaws my whole life in sparring and . I got a good right hand. I like fighting southpaws. Usually fighters don’t like to look far ahead like that. Are you taking maybe a bit too lightly this next fight against Bute? Absolutely not. I never said that. So I said, like I just answered the other question. I’m fully focused on Lucian Bute. I still got to beat this guy too. So right now our only focus is Bute. After that we’ll see what’s next. In the future I will definitely move up the latter. Badou I’m just wondering if you are able to beat Lucian and wind up fighting DeGale, how much does it help to fight southpaws back to back and kind of get into a rhythm of training for southpaws and back to back fights? I don’t know. It’s good to prepare for southpaws Like I said, it’s a very tough fight. So not looking past it I have to fight it. I got to be first. Then we’ll see. How did you think that Lucian Bute looked against DeGale? And if you could just kind of assess DeGale as a fighter as well. He looked good. People wrote him off like they did with me. They thought DeGale was going to blow him out in a couple rounds. But he looked good. That’s why he got this opportunity to fight again for the title because he looked that good. I think his style and my style will match perfectly. He likes to fight. I like to fight. We both got boxing skills as well. So I’m excited. James DeGale is a very good fighter too. He’s got a lot of skills, speed, Olympic Gold Medalist. He deserves a lot of credit. He went to Boston and to Canada. He’s a good fighter. Another very good fighter. Were you more impressed with his win over Lucian Bute or Dirrell? They both were similar opponents. I don’t think he’s been that active before that fight. I don’t know. But Lucian Bute is the former champion. He’s defending a lot of times. Dirrell was never a world champion, even though he’s on that level. But no, both were pretty good fights. DeGale is obviously fighting the same night as you are on the same card. What do you think of his fight? Obviously he’s a heavy favorite. What do you think of that fight? As far as talent and skills, he’s way better. But I’m fond of Medina. I know what kind of tough guy he is, mentally very strong. And he can punch. He’s dangerous. So I would say again I would not overlook him because this guy is dangerous. But I think he’ll win but he’s just got to be careful. Lucian keeps saying the same thing about you. That you’re a good boxer, but you’re not exceptional. And that you make mistakes. What is your reaction to those comments? I think that’s exactly what I want to hear. Lucian, he’s from the outside looking in. I am always in great shape. I know how to break an opponent down. Everybody is entitled to their own opinion and that’s his opinion. That’s good. That’s good for me. I would like to just comment that both fighters have been having excellent camps thus far. Both fighters are really looking forward to the fight on April 30. Both guys have a tremendous amount of experience. We know that Lucian Bute, he comes prepared. He’s a former world champion. He’ll be coming to take away Badou’s belt. Badou on the other hand he feels very, very good being world champion. He’s made a vow that nobody’s going to take his title away from him. So we’re going to have an excellent fight come April 30. I’m very excited. Now going to shift over to the co-main event, which is a very exiting match. We have James DeGale and Rogelio Medina. The winner of this fight will take on the winner of Jack versus Bute in the Super Middleweight Unification later this year. I would like to introduce our promotional partner, a very dear friend, in my opinion one of the top promoters in the world. Definitely the top promoter internationally. He’s done a phenomenal job with all of his fighters. I’m very, very impressed with all the work that he’s done with his stable of fighters over there. So without further ado, I’d like to introduce Eddie Hearn of Matchroom Boxing. Thank you very much. Thank you. It’s a pleasure to be on the media call and to be involved with the show. I was very interested to hear the comments of Lucian Bute who I know very well and Badou Jack. I think you probably know that but he’s a great fighter. I think he’s a really, really tough fight for Badou Jack. I think James DeGale has a tough fight with Rogelio Medina. But for sure that fight between Badou Jack and Lucian Bute is a wonderful fight. I think the stars will mix perfectly for a very, very interesting fight. Of course we saw Badou Jack had a great victory over George Groves who is still attempting to win a world title. But the interesting thing about this unification is how it feels to have an old Super Six style where the best fought the best. I think it’s wonderful for boxing that the whole world can watch almost like we said there a semifinal between four of the top Super Middleweights in the world. And the winners will go on to fight the winner. Of course I’m biased. But in every tournament you have a seed. Number 1 seed in this tournament is James DeGale. I think rightly so he’s been insatiably the number one Super Middleweight in the division. Andre Dirrell was massively underrated. I think the win against Lucian Bute was underrated and was also in Quebec City. The Dirrell fight was in Boston. This is not a guy who gets home comfort. This is not a guy who’s reliant on home canvas even. This is road warrior that’s traveling around the world to fight the very best, which is very, very unique in boxing today. So I’m really excited about DeGale. I think his confidence is growing and growing and growing. He’s a chronical character, even out of the ring. I think he’s going to put on a wonderful performance on April 30 in Washington. I think Jack, you’re going to see him in a very close fight. Then hopefully everybody can get what they want. DeGale against Jack in the unification title fight. These guys are ready to fight, ready to meet. And I hope they both come through because I can’t wait to see that fight. I can’t wait to see James DeGale get a run as the top 168-pounder. So it’s a pleasure to be working with Mayweather Promotions, of course SHOWTIME as well. I’m really excited to be down in Washington. I’ve not been there for a fight before. I’ve heard wonderful things. Be ready for a great night of 168 pound matches and two great fights and then hopefully the unification fight that everybody wants. Thank you. The current IBF Super Middleweight Champion of the world, James “Chunky” DeGale. The Champ. Hi. Yes, I’m feeling great man. I’m feeling real good. I was training extremely, extremely hard, as always. Feeling good. I can’t wait for the 30th. I’m not looking past Medina. He’s a very good fighter. A tough fighter in his own right. Every time he steps up to the highest level. He’s lost. On the 30th of April he’s going to lose again and I’m going to look unbelievable. Hello. Can you hear me? I know I’m the best 168 out there. I’m the best 168 out there and I need to prove it. I’m willing to do that. How much easier is it getting for you to get into the ring not in front of your home crowd? I’m used to it if I’m being honest. Listen, I won my Olympic Gold Medal away from home. I won my world title away from home. I’m actually getting used to it. That’s what I’m saying. So this is why I keep on telling you people, I’m a road warrior because I’m willing to go anywhere to fight anywhere and to prove I’m the best. But listen, my homecoming is coming as well. Yes that’s coming very soon. Once I beat Medina on the 30th of April, I want the Unification belt in London in front of my home people. Would that be as early as September? Yes well I’m ready, listen, I’m ready to go as soon as I come through this with no bumps, not swollen. So I’m ready to go, September is perfect for me. How much of a motivation factor is this tournament event on April 30 for you? It’s good. It’s good. This is what boxing needs. The best boxing the best. As I say, all I want to do is win titles and add the WBC title to my IBF would be fantastic because these days there’s not many unification fights because people don’t want to fight the best. But there’s four or five that come together in like a little tournament, like a mini tournament. And we’re going to see who the best is. How do you look at the possible prospective of having to fight Lucian once again in the fall? If I’m being honest, I don’t really want to fight Lucian Bute again. I think I beat him last time and I beat him pretty well. It was pretty convincing. I had everything against me as well. I still beat him well. I want to box fresh a new world champion, someone like Badou Jack. I think the clash of stars would be fantastic. We’re both hungry. We’re both here. And we’re peak. I think it would be a fantastic fight. But if Lucian Bute wins, we can do it again as I say. But this time around we’re doing it in London. What you think of Badou Jack and how he’s kind of come along as a world champion, particularly in his last fight against George Groves? How do you think a fight against him would go? Listen, I think Badou Jack is a very good fighter. I think he’s come on as he’s become world champion, he’s growing in confidence. He’s become a better all-around fighter. A couple fights ago, even I underrated him. I thought he wasn’t all that. But he’s proven in these last couple fights against Groves and against Dirrell that that guy is a worthy world champion and he can fight. But as I said, I’m the best Super Middleweight in the world. I’m willing to prove that. What do you expect, James, to happen in the fight between Bute and Badou Jack? I expect the fight to be a competitive fight. Bute is still great, as you see against me. He just came up just short. He just didn’t have it. But Lucian Bute is a very good fighter. It should be a battle. It’s Badou Jack, and I think he’s going to win. But it wouldn’t surprise me if Bute pulls it off. Everybody’s pretty much writing Medina off based on his rep. What do you know about him, because he’s going to be going with absolutely nothing to lose? Okay. I know that he’s a typical Mexican and a tough Mexican. I know he loves to have a fight. He’s tough. He’s strong. He’s game. But every time he steps to the highest level, right, he’s lost. He’s been stopped or he’s lost. I’m not overlooking him. I’m training extremely hard. I’m going to win and look good. I’m looking to the point of a proper show, a good standout performance. Are you going to, in your mind, try to compare your performance against him to Badou Jack’s because he scored a TKO against him in 2013. So he obviously can’t do that. But do you got it set in your mind that you want to go for a knock out to make that point? Yes. Listen, if a knockout comes, it comes. But the way I’m feeling and my momentum, my confidence is sky high. It’s sky high. And someone like – as I said before, no disrespect to Medina. He’s a good fighter in his own right. But I’m a couple levels above him. I’m elite. I’m an elite fighter. I’m the best in the division. So I should have no problems in the fight. How do you just focus on this fight and then take care of what happens afterwards? Listen, I’m a true professional. I’m fully focused. I take one fight as it comes. The first step is “Porky” Medina. But I’ll be ready for that. Then we can move on to the next fight. I don’t really. Well actually I do like making predictions, but my last couple have been wrong. But let’s have a bit of fun to make one. Again, I say within six rounds I’m going to stop Medina. James, you said you would rather Badou Jack to win against Lucian because you already fought Lucian. But would you think about not going for the unification fight if Lucian wins it? And just maybe challenge one of the other champions in the other organizations? Maybe. It depends. I want that WBC. It’s been around for years. It’s one of the oldest belts. It’s probably the most prestigious belt. So I want to add that to my collection. So if Lucian Bute wins, we can do it. But next time we do it in London. It’s simple. Would you rather try to get four belts at 168 before moving up? Yes. I would love to. As I say, I just want to prove to everyone I’m the best Super Middleweight. First I want to clear up the Super Middleweight division. Would you like to see more of these types of tournaments? I would. I would. As I say before that unification fights rarely happen these days. It’s pretty sad. But yes, I would like to seethe best box the best. The champions boxing champions. That’s how boxing should be. Just if you had one advice to Badou Jack for winning against Bute, what could you say to him? What shall I say to him? Just be fully, just fully focused. And don’t overlook Lucian Bute because he’s still a force in the Super Middleweight Division. He’s still got a bit left. So as I say, he’s got to be switched on and fully focused. Thank you James for those wonderful comments. I’d just like to touch on one thing. I’m very, very excited too for your fight with Rogelio. I know it’s going to be a very, very exciting fight. Honestly, Badou is looking very forward to fighting Lucian. just wanted to add, he’s been begging me, and when I say begging me, begging me. If he gets past Bute, he’s very, very excited, looking forward to fighting you. Fantastic. I hope you are a man to your word. I hope you and Badou Jack are a man to your word. That would be a fantastic fight. If you come through it fast to United Kingdom that would be an honor. Trust me, but as said before, I’m the best in the division and I want to prove it. So can’t wait. Yes. I would like to thank everyone for joining us on this wonderful call today. We have a very, very exciting card, as you’ve heard from the fighters, on April 30 in Washington, D.C. This fight will be immediately following the PBC on FOX show which will feature headline Andre Berto versus Victor Ortiz. So that should be a tremendous fight. And I’d like to thank everyone again for joining the call.